Jimmy Young was possibly born in 1923, but most sources including Jimmy Young's autobiography claim 1921. The confusion is probably because Leslie Young, as he then was, exaggerated his age in order to enlist in the armed services. To most listeners of today's BBC radio Jimmy Young is an ageing Disc Jockey. Only those of us well into our late 50s or beyond are likely to remember his days as a heart-throb crooner. Yet he was indeed once one of Britain's greatest popular singers and he has an enviable chart history to prove it. 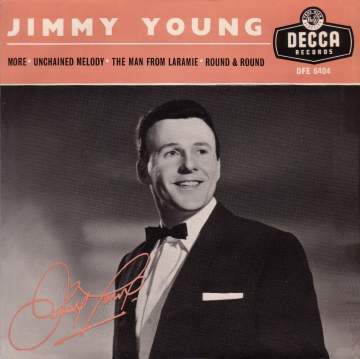 Jimmy Young, the singer, first came to the attention of the British public with his version of the song 'Too Young' in 1951, more than a year before a meaningful chart showing relative record sales began. This record received a lot of BBC air-play and helped him establish himself as, arguably, the UK's top crooner. However it was during 1955 with his versions of 'Unchained Melody' and 'The Man From Laramie' that he became the first British artist ever to achieve the coveted #1 chart position with consecutive releases. The EP illustrated on the left, Decca DFE6404 is a particularly nice item to find. In addition to a great picture of the singer himself and some of his best recordings, it is backed by interesting biographical notes. In particular, it tells us that Jimmy's first experience as a singer came as a member of the church choir in Gloucester Cathedral. He was a bright lad who went to the local Grammar School but took jobs as a baker and electrician to help the family budget while he was still only 15. It also mentions his exceptional sporting abilities and the fact that he was even offered a contract to take up a professional rugby career with Wigan. Jimmy Young's relaxed vocal delivery had a lot of appeal to housewives during an era in which record buying was beginning to become dominated by teenagers. It was of no surprise that he was asked to do a stint as guest DJ on the evergreen BBC radio programme 'Housewive's Choice'. This short introduction to another side of popular music would help set the seal on a new career that he developed as the 1960s progressed. By the 1970s he had given up singing to become a full time broadcaster, a role for which his personality and background have made him ideally suited. Sadly, some of Jimmy Young's earliest recordings are available only on 78rpm and are not featured here. Most of his records prior to 1957 were sold on the 78rpm format and these are hard to find now as 45s. However there are still a few 45s, particularly those from his later singing years, that can be found without too much trouble. Note many of Jimmy Young's discs were on 78s and do not appear here. Pye NEP24004 1955 "Jimmy Young Sings"
Decca DFE6277 1956 "Presenting Jimmy Young"
Decca DFE6404 1957 "Jimmy Young"